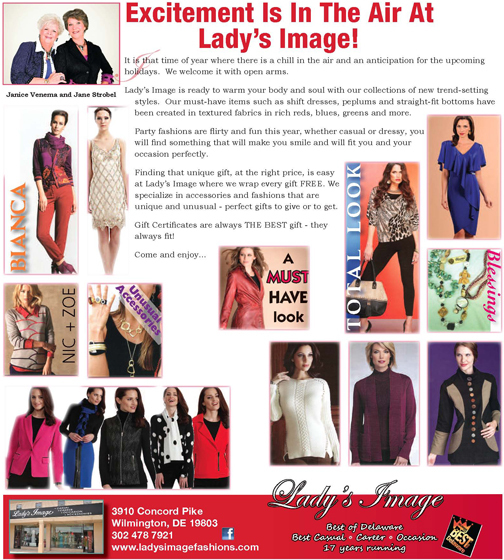 Excitement Is In The Air At Lady’s Image! It is that time of year where there is a chill in the air and an anticipation for the upcoming holidays. We welcome it with open arms. Lady’s Image is ready to warm your body and soul with our collections of new trend-setting styles. Our must-have items such as shift dresses, peplums and straight-fit bottoms have been created in textured fabrics in rich reds, blues, greens and more. Party fashions are flirty and fun this year, whether casual or dressy, you will find something that will make you smile and will fit you and your occasion perfectly. Finding that unique gift, at the right price, is easy at Lady’s Image where we wrap every gift FREE. We specialize in accessories and fashions that are unique and unusual – perfect gifts to give or to get. Gift Certificates are always THE BEST gift – they always fit!